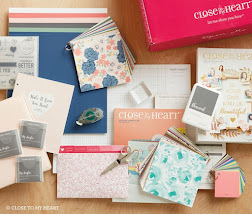 Blog for Shelly Mendenhall, Close to My Heart Independent Consultant, located in Fayetteville, North Carolina. 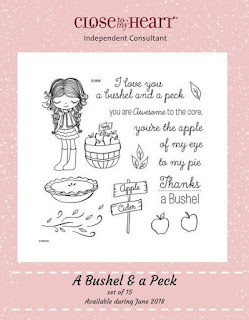 For all your scrapbooking, cardmaking, or paper crafting needs; please contact me either by phone/text at (910) 309-3032, email inkywheeler@gmail.com or shop direct from my Close to My Heart site. A Shop With Me button can be found in the right side bar of this blog. Welcome to the June Stamp of the Month Blog Hop by Close to my Heart. You should have arrived here from Haley Dyer's blog. The blog is one continuous circle so you can always follow from here to get back to the beginning; or alternately, you may click Melinda Everitt's blog to find the full list of participants and locate the spot you were on. 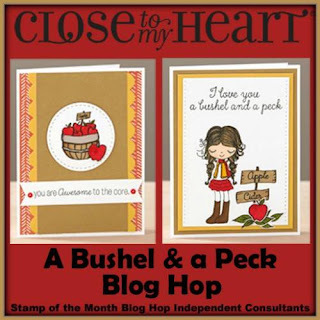 This month's Stamp of the Month is entitled " A Bushel and A Peck". It has 15 darling stamps including images as well as sentiments. The item number is S1806. As always, you may purchase the Stamp of the Month outright for $17.95 plus tax and shipping or for $5 with a $50 or more order. 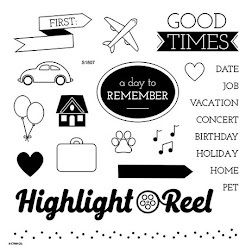 Below is a full graphic of the stamp set in its entirety. Now for my project. I created a simple greeting card using card stock and the tea pot patterned paper from the Beautiful Friendship Workshop on the Go kit. I stamped the little girl, pie, and the sentiment in Memento pigment ink. The pie and little girl are colored in with Shin Han Markers. Finally, to add a bit of bling, I attached a blue bow. I hope you have enjoyed viewing my project. Before you go, would you please offer me your feedback on my projects and what you would like to see me offer in the future? Thanks! Now, head on over to Alayne Fleming's blog to continue on the hop and view her beautiful artwork. See you next month! Thanks Haley! That colorless blender is a life saver for getting the right tones. Blue bow is a great addition. Love the colors.